Trail Mixed Memories: Long Beach Solar Grand Prix! 4/20 Check it out! Are you looking for something different to do this weekend? 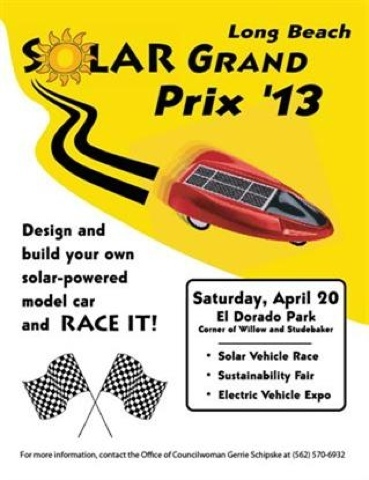 On Saturday, children, grades 6-12 compete in the annual Solar Powered Grand Prix! Councilwoman Gerrie Schipske is sponsoring the Fourth Annual Long Beach Solar Grand Prix competition in which students, grade 6-12, are invited to design and build a solar-powered model car that will complete a race in the shortest possible time using the available power. The Solar Grand Prix challenges students to use scientific know-how, creative thinking, experimentation, and teamwork to design and build high-performance model solar vehicles. Teams will receive a Solar Car Kit, which includes a solar panel and an electric motor. Using any other materials, competitors will design and build a model solar-powered vehicle that will race on a 20-meter (65-foot) racecourse. The winner of the competition will be the team whose vehicle is the top finisher in a series of head to head elimination rounds. Looking for construction tips or educational resources? There are a number of great resources at the National Renewable Energy Laboratory's Junior Solar Sprint website(remember that some of their rules may be different). The Introduction to Building a Model Solar Car is an especially useful resource for thinking about and understanding the different components of car design. View the PowerPoint Presentation from the 2013 Team Orientation here. Be sure to watch this video from Discovery Education that considers how solar power can be used to generate electricity. Learn about the EcoCar Competition and the local team from Cal State LA. Information on the CSULB Society of Automotive Engineers. This is not a sponsored post. I did not receive any compensation for this post. All thoughts and opinions are my own. Do not use any pictures without permission. I love your tagline/about section at the top of your blog. I hope to be the same when I have kids!